Seven exiled Tibetan monks will visit Manchester University at 7:30 p.m. on Thursday, Sept. 19 with a cultural program of dance, chanting and prayers for global peace and harmony. The public is invited to the program in Wine Recital Hall on the North Manchester campus sponsored by the MU Peace Studies Institute. In partnership with the Tibetan Mongolian Buddhist Cultural Center in Bloomington, Ind., the refuge monks are touring the United States to teach the Dharma, educate about the culture and religion of Tibet and raise funds for the Labrang Tashi Kyil Monastery in Dehra Dun, India. In 1925, Chinese troops stormed the monastery, machine-gunning thousands of Tibetan monks as they tried to flee. Genocide war against the monks continued with burnings, decapitations and other horrors and the original monastery in Amdo, Tibet was looted and destroyed. The exiled monks rebuilt their monastery in Dehra Dun, India in 1967, and preserved the chanting styles, rituals, practices, and self-initiations. In addition to Dharma studies, the monastery offers classes in Tibetan grammar and English. 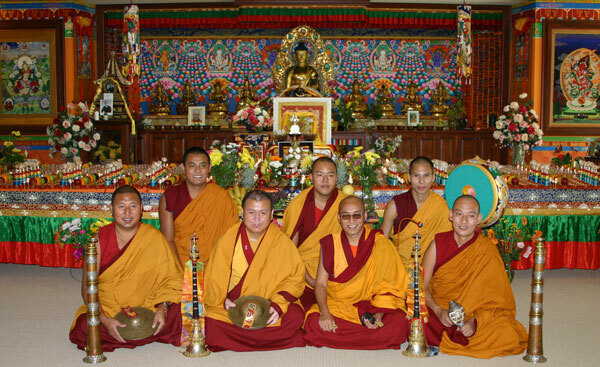 The monks will be in North Manchester just for one evening during their five-day visit to Fort Wayne, where they will perform ceremonies, painstakingly construct an intricate and colorful sacred sand Mandala and present cultural programs at several venues. See the Fort Wayne schedule here. “Manchester University is honored to host monks from the Tashi Kyil Monastery to mark the United Nations International Day of Peace (Sept. 21),” said Katy Gray Brown, director of the Peace Studies Institute. “On this day, we recommit ourselves to building peace among all nations and peoples – a charge that reflects Manchester’s central values of peace and the development of an international consciousness." While in North Manchester, the monks will dine with students and faculty.